After the company she co-owns goes bankrupt, the bank takes her flat, and her lover goes home to his mother, Polly finds herself living in poky little flat over a decrepit-looking bakery on the tidal island of Mount Polbearne off the Cornish coast. There she returns to her old hobby of bread-baking and slowly begins to supply bread to the island’s inhabitants, befriending some of them along the way. Of course, as is to be expected, Polly becomes quite a successful baker, regains the security and confidence she lost in the bankruptcy, and falls in love with a total hottie. While Colgan does not skirt around the difficulties of life in a dwindling British fishing community and the book can be quite heartbreakingly sad at points, it is still an overwhelmingly warm and pleasant book, full of lovely carbs, honey, and puffins. Oh my cake, the puffins. THE PUFFIN. Neil is the best puffin sidekick a reader could wish for and I am so pleased to see Colgan has written an entire children’s series about Polly and her Puffin. 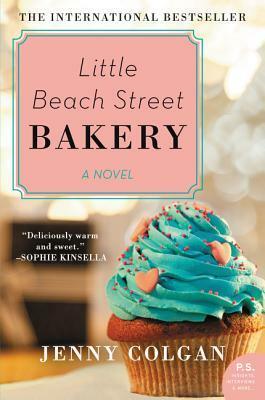 As with Colgan’s other foodie romances, there are several recipes at the end of Little Beach Street Bakery. The cheese straw recipe looks like something to serve with tomato soup and the focaccia is definitely a yeast bread I could handle ... not so sure about the cinnamon buns or the bagels, though! There are two more books in the Little Beach Street series, Summer at the Little Beach Street Bakery and Christmas at the Little Beach Street Bakery, and I’m really looking forward to getting my hands on them as soon as possible. (Did I mention the book quotes the Water Boys extensively? No? Well, it does. I know. I know. References to the Water Boys and lots of good bread? Heaven). 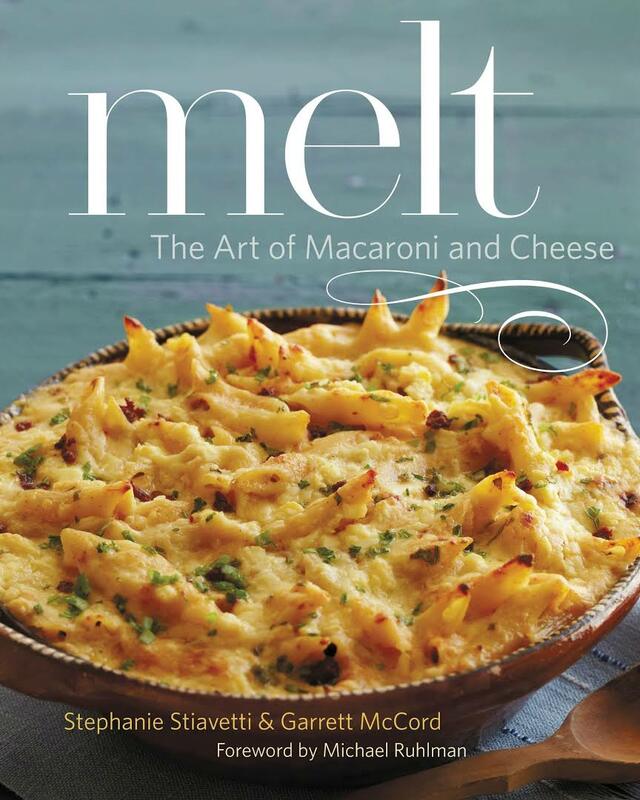 For September's library cookbook club, one participant brought "Roaring Forties with Honey Roasted Delicata Squash, Sage Butter, and Rotini" from Stephanie Stiavetti & Garret McCord's Melt: The Art of Macaroni & Cheese (Little, Brown, & Company, 2013). She'd checked out the book, completely enamored with the gooey cheesiness on the cover, but then been kind-of turned off by most of the recipes in the book as they were not "mac and cheezy" enough for her -- the cookbook is a very "gourmet" take on macaroni and cheese, using many pricey, artisanal cheeses. Anyway, she did not think much of the rotini recipe -- felt in needed bacon and a different cheese, but brought it along anyway for us all to try. Overall, we found the dish unmemorable ... a bit dry and the flavors didn't meld together, but it wasn't bad in any definable way ... just rather meh. We all agreed the addition of something (probably bacon or pancetta) might have improved it. Admittedly, the cook had substituted butternut for delicata (couldn't find delicata at the shops) and another blue for the Roaring Forties (ditto). And the dish sat for an hour or so at room temperature before the cook book club sampled it ... so its meh-ness was not entirely the recipe's fault. I ended up bringing Melt home with me after the meeting and kept going back to the rotini recipe, wondering if I could do better with the correct ingredients. Then I looked around on the Internet for Roaring Forties cheese and found that it was a fancy Australian blue cheese that retailed for $38/pound. Well, I thought, that's a clear nope. Ah. But then ... delicata squash appeared in my CSA share and I decided, what the heck, I would give the recipe a try. An entire rainy afternoon lay open before me, rich with possibility, so I cracked open a bottle of red and went to work. 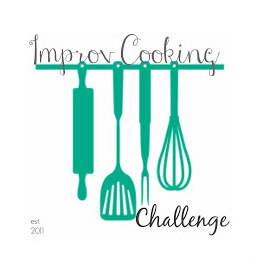 [While no one recipe step is difficult or fiddly, so much of the dish is prepared separately, only to be brought together at the end, that it feels as if the recipe is taking an inordinate amount of time to make. Therefore, I really recommend you make this dish when you're feeling totally mellow and chillaxed about cooking, with lots of time on your hands, and (definitely) an open bottle of red to keep you company]. 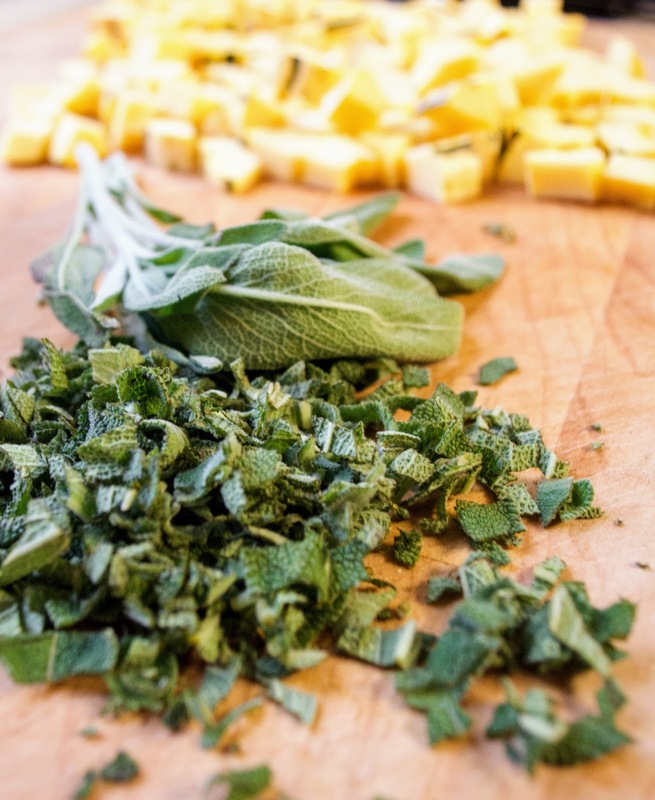 First, you make the sage butter by heating butter, fresh sage, sea salt, and honey over low heat. Then you pour it over the chopped delicata squash and toss it until everything is coated and roast the squash for an hour. 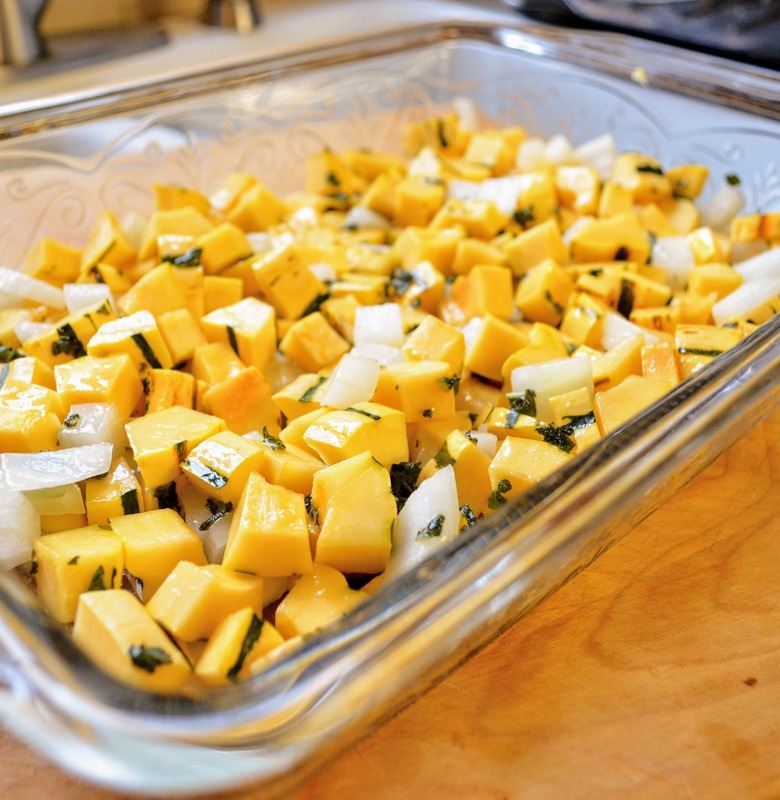 (The recipe said to use a 8-inch square baking dish, but no way were my two chopped squash going to fit in that pan. And then, since there was extra room in the 13x9, I added one large diced sweet onion). Then, you cook the pasta until al dente and set it aside. (I used 100% whole wheat rotini, because I hoped -- rightly it turned out -- the firm texture and nutty, grainy flavor would benefit the finished dish. I also tossed the cooked pasta with a little unsalted butter before setting it aside, because butter is flavor and dried-out noodles are just sad). Then, you toast the pecans in a skillet until fragrant and set aside. (I have a horror of burning nuts so I may have under-toasted mine, but they were still delicious). 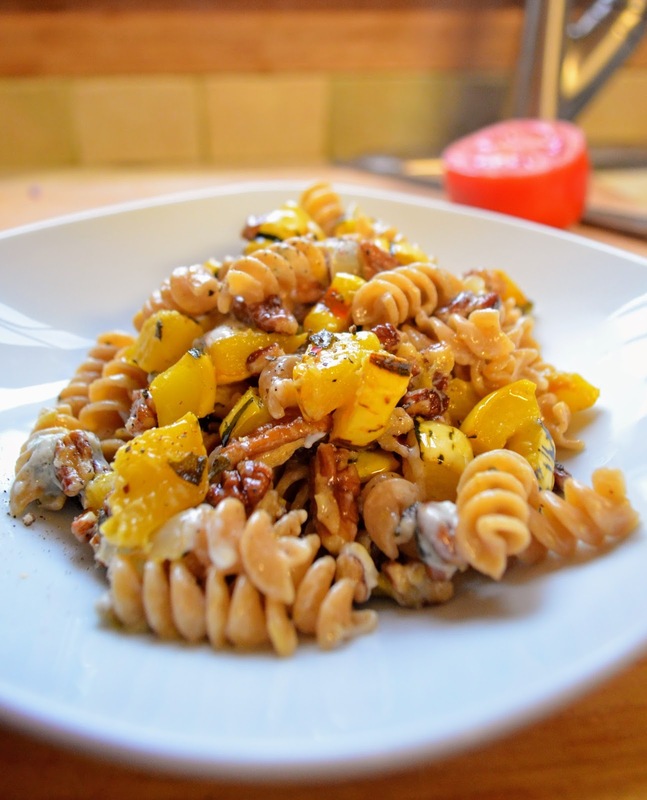 Then, you add the pasta and blue cheese (Litehouse Simply Artisan Reserve Blue Cheese Crumbles, because I wanted an affordable mild, creamy blue) to the squash pan and give everything a good stir, garnish with toasted pecans, and eat ... except I was like "To hell with garnishing!" and stirred the pecans in with the pasta, squash, and cheese. It might not have been so photogenic, but I liked that the pecans became coated with the melting cheese and pan juices. Eaten straight from the baking dish, this rotini was really good. The onion and extra butter definitely helped, I think, as did using a soft blue that mostly melted into the dish. The flavors really came together and I loved the sweet caramelized delicata squash. Definitely didn't need any bacon! 13/10 would make again. Next, I think, I'll try Melt's "Pastitsio with Kefalotyri and Lamb," because I love a good pastitsio/pastichio. But, yeah, it's going to be even more time consuming. Wine will help, no doubt. 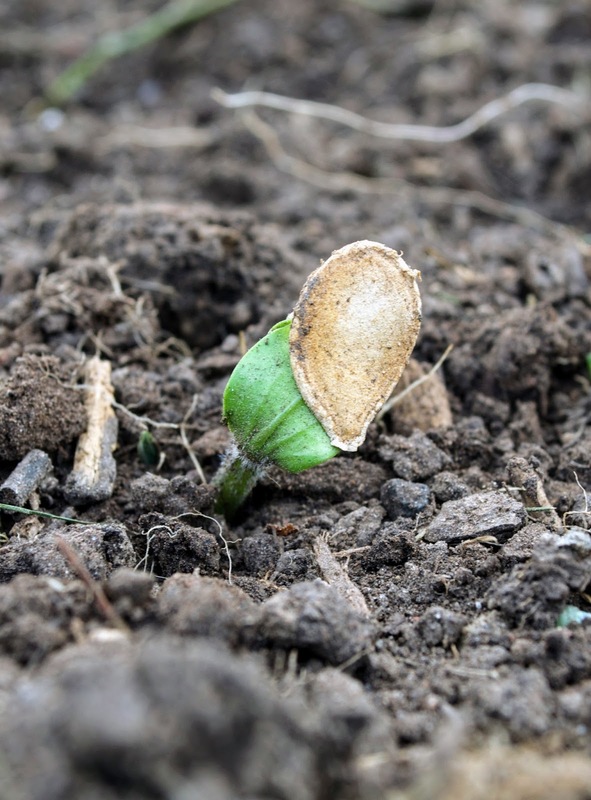 Foolhardy pumpkin seed trying its best to sprout ... the frost will get it soon enough. Halloween decorations at the farmstand that used to be Krell Farm. 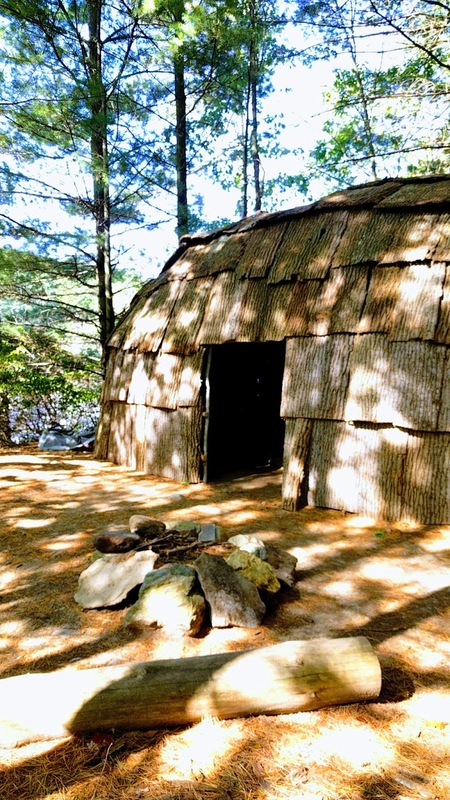 Feels very Little House on the Undead Prairie to me. 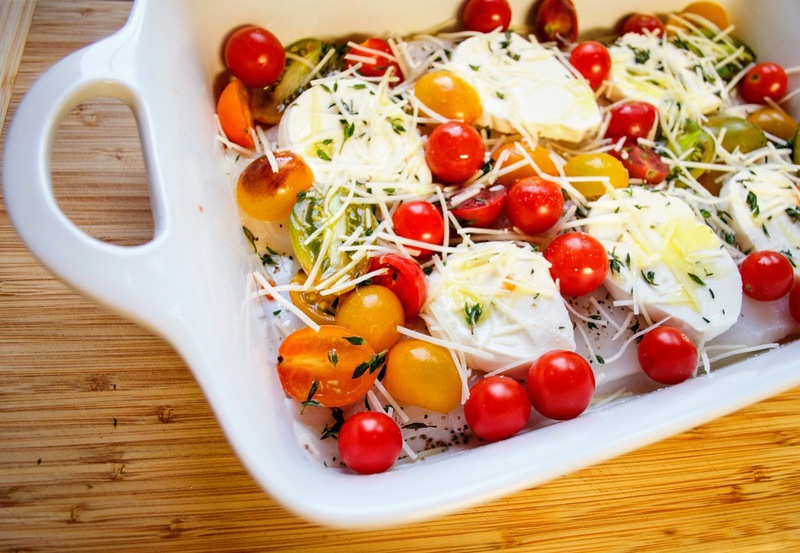 Jamie Oliver's "Roasted Cod with Cherry Tomatoes, Basil and Mozzarella" from Happy Days with the Naked Chef (Hyperion, 2002) remains one of my favorite ways to prepare cod. It's a fantastic-tasting dish -- very simple with bright, clean flavors -- and goes together lickety-split, making it perfect for weeknight suppers. 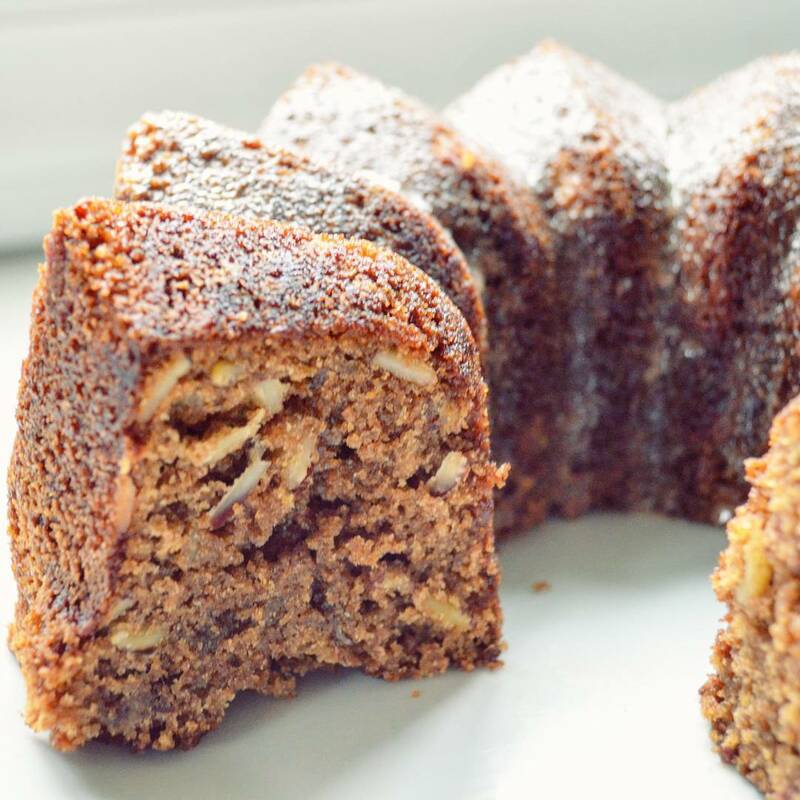 It takes less than an hour to prepare and is so satisfying! I usually serve it with green salad and/or buttery parslied potatoes. Oliver's recipe calls for fresh basil, but I've also made it several times with a mixture of fresh rosemary, thyme, and oregano -- much depends on which herb plants are thriving at the time. 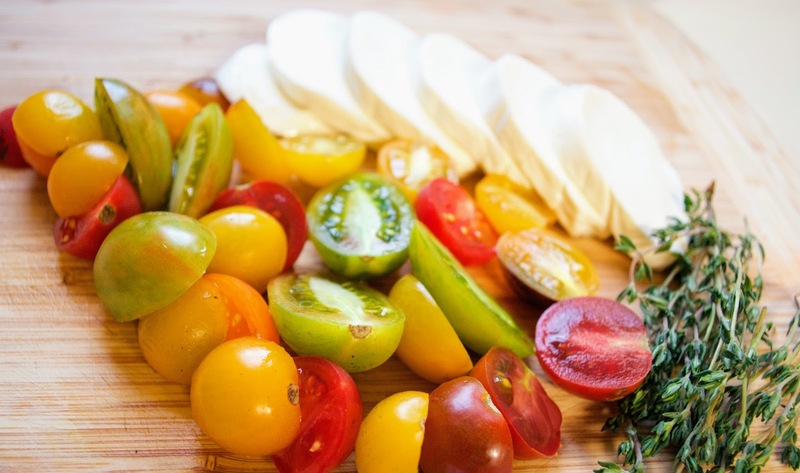 Also, cherry tomatoes are great in this recipe, but sliced beefsteak tomatoes will also work. Again, much depends on what's in the garden! 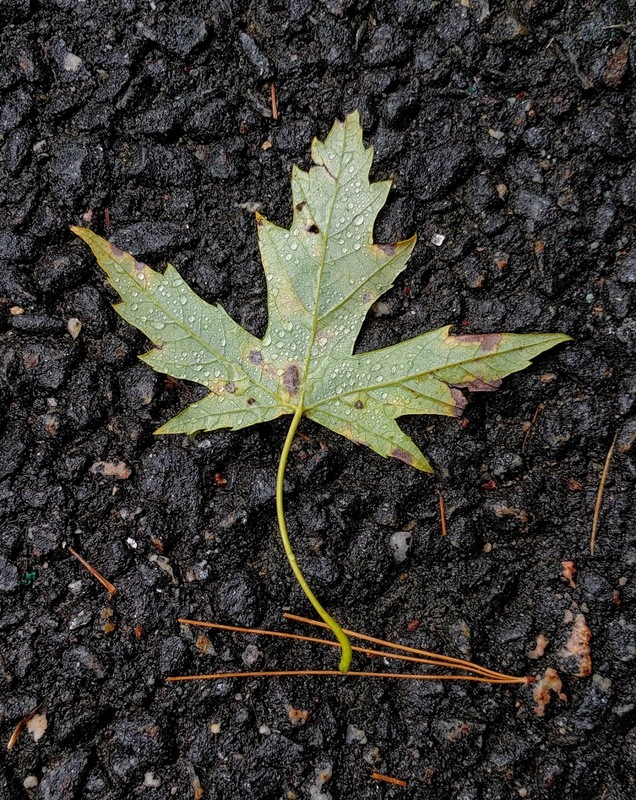 Rain-speckled leaf on a wet autumn day. This dish one-pan chicken and vegetable dish makes a comforting supper on a murky October Sunday. 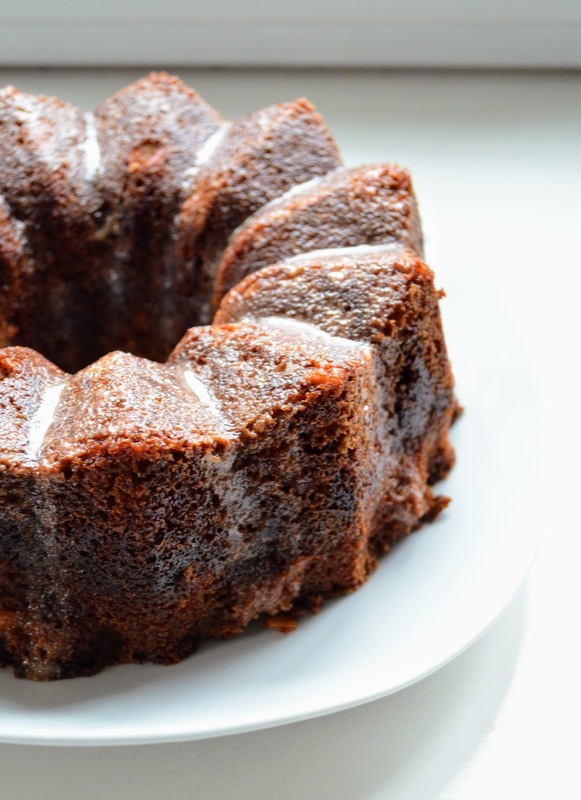 Not only will it fill your house with delicious odors, but it assembles in no time at all and can simply be forgotten in the oven until the timer goes ding -- leaving sufficient time for book-reading or cat-petting. While I used fresh thyme when I made this, because that's what was still thriving in my garden, fresh oregano or marjoram would be tasty, too. You could probably use drumsticks instead of thighs, but I don't know how that would change the cooking time -- a meat thermometer would be a your friend, there. I wouldn't use boneless skinless thighs, because the bones lend flavor and the crackly roasted chicken skin is not to be missed. Place the chicken thighs in a casserole dish. 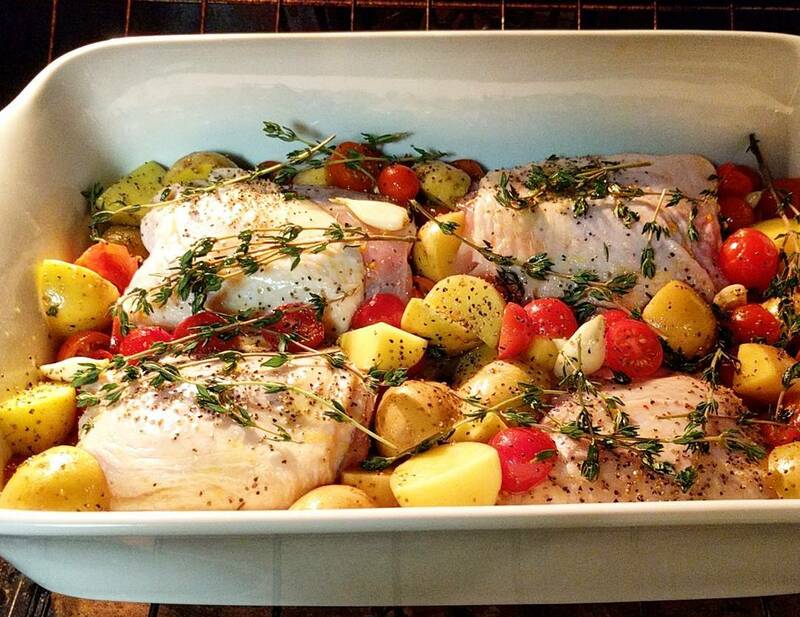 Arrange tomatoes, potatoes, and garlic cloves around the chicken. Drizzle everything with olive oil and season generously of with salt and pepper. Scatter with thyme sprigs. Roast, uncovered for 45 minutes or until chicken thighs reach 165°F. Set oven to broil and broil 5 min or until chicken skin is crisped and brown. Serve the chicken and vegetables in shallow bowls with chunks of delicious crusty bread to sop up all the lovely pan juices. 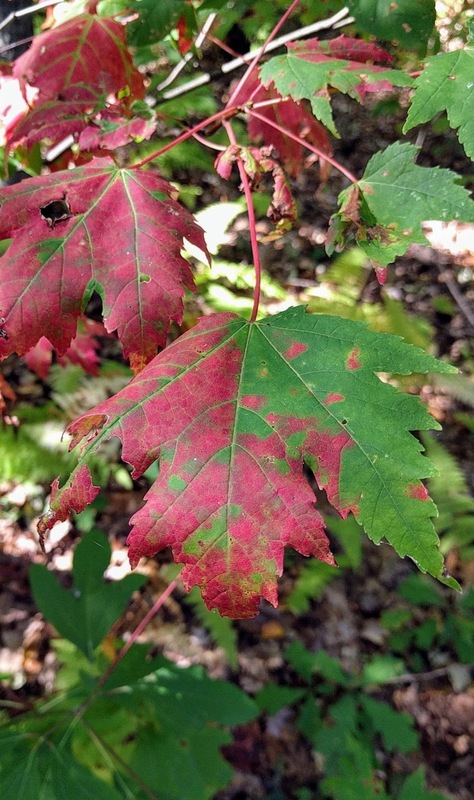 Mother Nature's been splashing around with her paint pots, again.